Succulent Maine Lobster chunks, served chilled with just a touch of lemon mayo, nestled in a butter grilled roll. Chunks of Maine Lobster, served warm, drizzled with melted butter on a butter grilled roll. 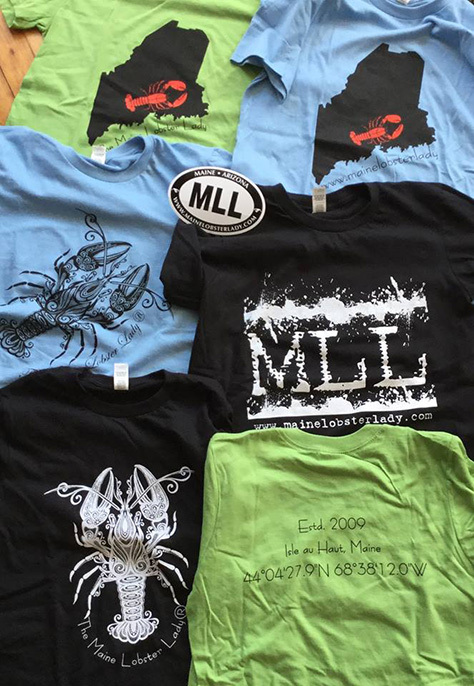 For the serious Lobster Lovah. Double the meat! Can be ordered either Traditional Style or Hot Buttered. Chunks of Maine Lobster, 1/4 lb., dry breaded and deep fried. Served on a bed of greens with 2 homemade dipping sauces-garlic and herb aioli and cocktail sauce. Chunks of chilled Maine Lobster, 1/4 lb., on a bed of greens with cucumber slices, saltine crackers and homemade cocktail sauce. Smooth, rich and creamy with a touch of sherry. The essence of the sea and pure Lobstah love! See note below. Q: What is a Maine Lobster Roll? A: Maine Lobster Roll is fresh Maine Lobster tossed with a bare hint of lemon mayo and nestled into a top split, New England style, butter grilled roll. 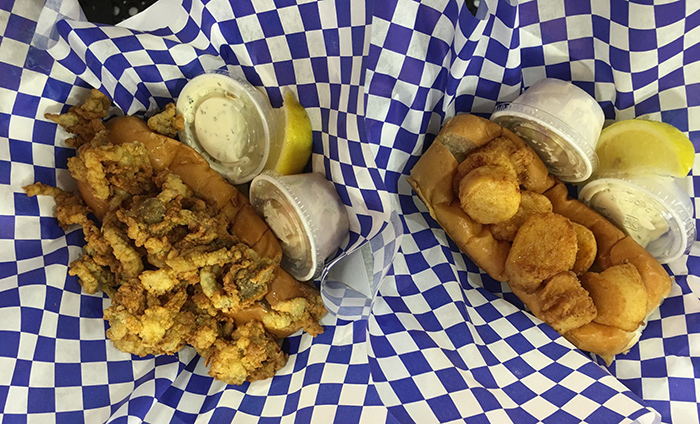 We have our rolls baked for us so they’re a bit bigger than the ones you find in Maine….fluffy on the inside, toasted, buttery goodness on the outside and the perfect contrast to our Traditional Maine Style roll with chilled meat…….and hello…..butter on butter with our Hot Buttered Roll! A: Well, it’s not a Subway footlong….it’s about the size of a hot dog roll. That’s what a Lobster Roll is. And yup, it’s pricey-even in Maine. We put 1/4 lb of Lobster meat in ours. If you want bigger, order the “Oversize”-double the meat and nearly double the price! Select Maine Clams with bellies, dry breaded by hand and deep fried. Served in a butter grilled roll with my garlic and herb aioli. Maine Sea Scallops, dry breaded and deep fried. Served in a butter grilled roll with garlic and herb aioli. Maine Lobster and Haddock in a flavorful, traditional “New England style” creamy broth with fresh corn and potatoes. Served with “oyster” soup crackers. See note below. A generous portion of Haddock, mild and flaky, dry battered and fried to golden. Served on a butter grilled roll with fresh greens, sliced tomato and garlic and herb aioli. Rich, moist, chocolate cake sandwiching fluffy vanilla filling. The perfect hand held snack and quintessential Maine treat! Maine Lobster and penne pasta in a creamy, cheesy Lobster sauce, sprinkled with herbed crumbs. The ultimate comfort food! Only available occasionally! Fresh greens, locally grown when available, cucumber and red and yellow baby tomatoes topped with 1/4 lb. Maine Lobster and sprinkled with fresh berries, dried cranberries, sliced almonds, fresh locally grown sprouts and a lemon wedge. Served with my own homemade, fresh lemon vinaigrette. Only available occasionally! Homemade, herbed Bakewell Cream biscuits, drizzled with melted butter and topped with chunks of Maine Lobster and Lobster “gravy” Think Lobster bisque, but thicker with a bit more cream! Only available occasionally! Whipped garlic and herb, red-skinned potatoes, made with copious amounts of butter and cream, topped with chunks of warm, Maine Lobster and drizzled with melted butter. Only available occasionally! * These items include a bag of chips and homemade Blueberry Coleslaw. **All items are subject to applicable city and state sales tax. I usually have only one of the above soups available on a given day-just depends on how the spirit moves me! 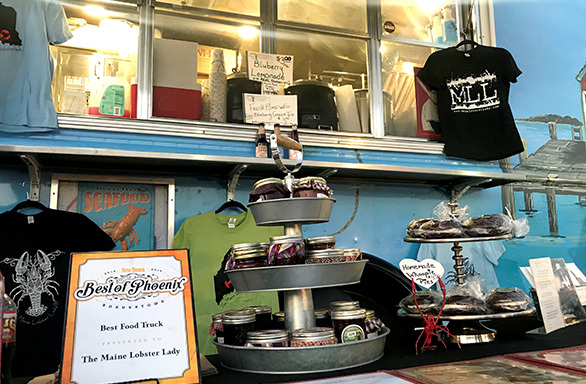 Next time you are at the Food Truck, take a look at Lobsterette & Artiste Sally’s postcards and notecards that she creates from her paintings. 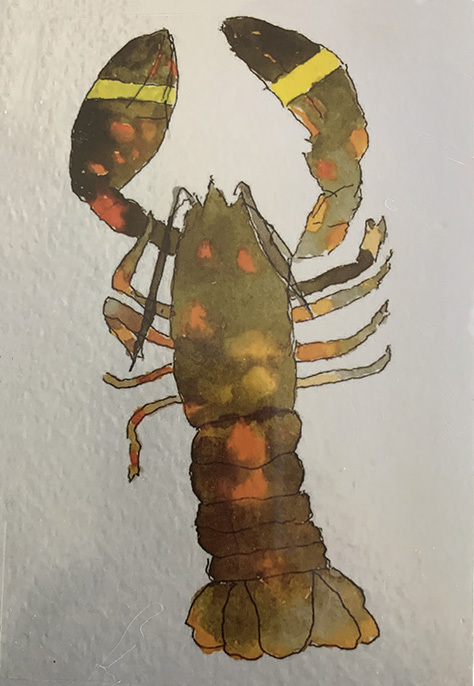 This lobster card is one she did and we sell them right at the truck along with our t-shirts and other homemade Maine treats!